Looking as though she jumped straight out of a classic Disney comic, “Minnie Mouse” is once again ready to stand by Mickey’s side. Mickey Mouse and Minnie Mouse are an inseparable pair, so it is only natural that Steiff introduces this immortal duo together. 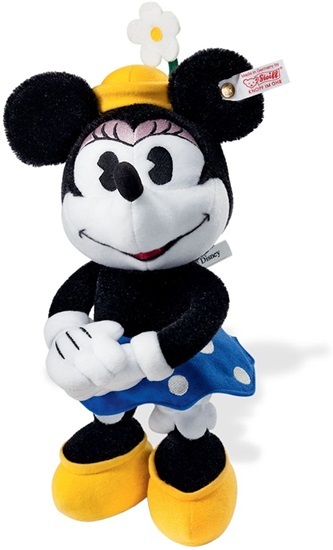 “Minnie Mouse” is 9-inches tall and sewn from the finest black and white mohair. She is dressed in the traditional blue skirt with white polka dots, white bloomers,and her famous yellow shoes. An adorable yellow hat sits atop her head completed with a felt flower. She is one way jointed at the neck and is surface washable. She has a white tag with the gold “button in ear” and is a limited edition of 2000 pieces.